As a designer, are you fully aware of the work health and safety legislation and regulations in the State or Territory that you practice? All states and territories agreed to harmonise their work health and safety laws so each jurisdiction would be similar, however individual state and territory regulators are responsible for adopting and enforcing their own laws. And, designers have a responsibility to ensure they’re meeting the relevant requirements in their individual state or territory. The Act outlines duties in relation to workplace health and safety including those of designers. Regulations and Mandatory Standards detail the mandatory requirements and provide additional information about how designers can fulfill their duties. Other legislative provisions include the National Construction Code of Australia (NCC) including the Building Code of Australia (BCA) and the building laws in each jurisdiction (state or territory). Codes of Practice (COP) and Non-Mandatory Standards provide guidance on how to implement the legislation. Compliance is mandated unless the same or better is achieved. 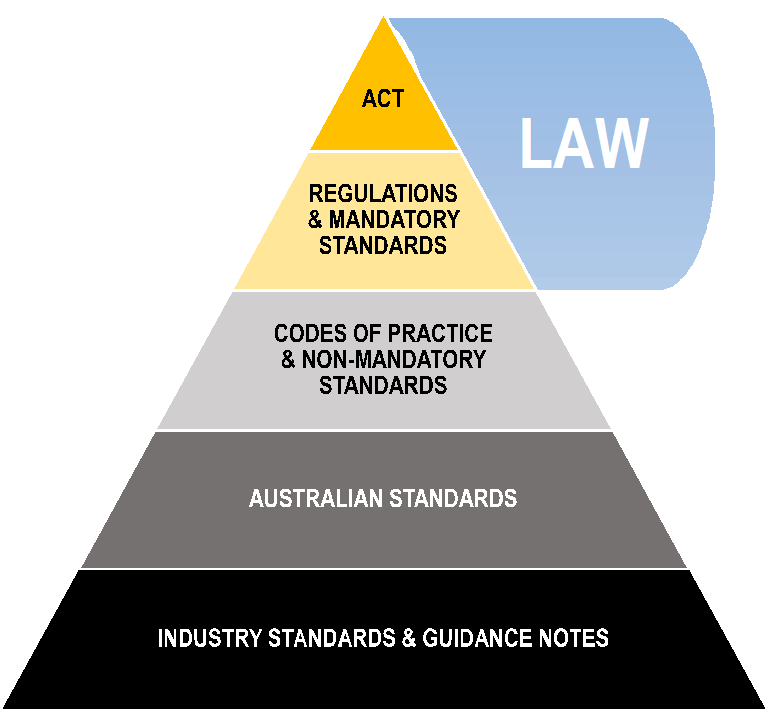 Standards include Australian and technical standards – some are referred to in legislation (law). Guidance Material include industry-specific safety standards and guidance material produced by the regulators and industry. The legislation and corresponding regulations in each state and territory in Australia vary slightly. It’s important that designers are familiar with their duties in the state or territory in which they practice. The following table has an overview, with relevant links to help. Work Health and Safety Act 2011 (ACT); and Work Health and Safety Regulation 2011 (ACT). Work Health and Safety Act 2011 (NSW); and Work Health and Safety Regulation 2017 (NSW). Work Health and Safety (National Uniform Legislation) Act 2011 (NT); and Work Health and Safety (National Uniform Legislation) Regulations 2011 (NT). Work Health and Safety Act 2011 (Qld); and Work Health and Safety Regulation 2011 (Qld). Work Health and Safety Act 2012 (SA); and Work Health and Safety Regulations 2012 (SA). Occupational Health and Safety Act 2004 (Vic); and Occupational Health and Safety Regulations 2017 (Vic). Occupational Safety and Health Act 1984 (WA); and Occupational Safety and Health Regulations 1996 (WA). Work Health and Safety Act 2011 (Cth); and Work Health and Safety Regulations 2011 (Cth). Includes commercial and residential buildings. NEED MORE INFO? Talk to us. Want to find out more about your Safe Design obligations and how to navigate these in relation to your specific design project? Get in touch! You can also download our FREE EBOOK. We’ve also developed a great training resource specifically for building designers, architects, engineers, and other building design professionals. Check out our flexible and convenient ‘Safe Design Online Short Course’, designed to assist you understand and practice safe design principles. It’s endorsed by the Safety Institute of Australia (SIA)’s Professional Development.